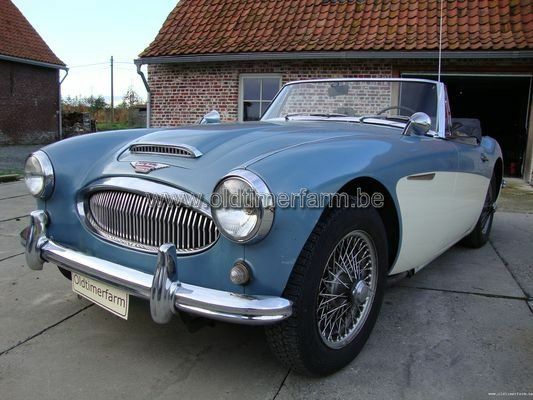 (from Wikipedia, the free encyclopedia) The Austin-Healey 3000 is a British sports car built from 1959 to 1967, and is the best known of the 'big' Healey models. The car's bodywork was made by Jensen Motors, and the vehicles were assembled at the BMC Abingdon works. The 3000 was a successful car which won its class in many European rallies in its heyday - and is still used in competition by enthusiasts today. The 3000 Mk III was launched in October 1963, and remained in production until the end of 1967 when production of Austin-Healeys finally ceased. (One further car was built in March 1968.) Classified as the BJ8, the new model was the most powerful and luxurious of the big Healeys, with a walnut-veneer dash, wind up windows, and 150 hp (112 kW) engine. 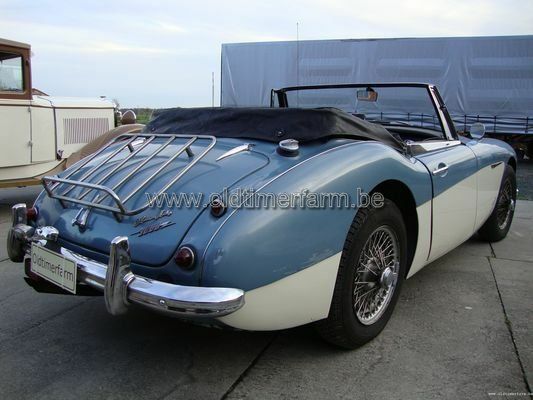 Improvements to the engine included a new camshaft and valve springs, and twin SU 2" HD8 carburettors, together with a new design of exhaust system. Servo-assisted brakes were now fitted as standard. Only 2+2 seat versions were made. Option extras were similar to those offered for the MkII, the main change being that the standard interior trim was now Ambla vinyl, with leather seats being added to the list of options. In May 1964 the Phase II version of the MkIII was released, which had a modified rear chassis to allow rear ground clearance to be increased, and subsequently, in March 1965 the car also gained separate indicators. Specifications. Body : length/width/height/wheelbase – cm (in) : 401/153/124/233 (157.5/60.5/49/92); weight : 1158 kg (2553 lb). Engine : 6-cylinders front 2912 cc (r178 ci), 4-speed manual, 133 bhp @ 4750 rpm. Top speed : 182 km/h (112 mph).